We have just returned from a three-week trip to Sydney, which was primarily to help out where needed with a house move and to ensure that both houses were occupied until settlement. My sister and family were not moving far, so commuting between houses was not hard and our two nephews have settled into their new schools. 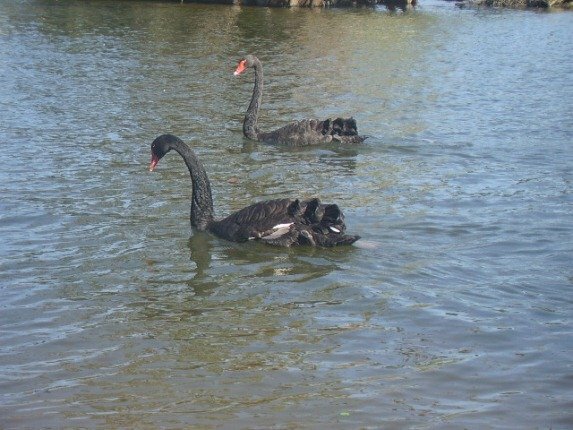 On previous visits we have not had the opportunity to go birding and we were looking forward to some day walks and adding to my 2012 list. We discovered we could get a ticket from the train station that gave us unlimited travel on trains, buses, ferries and light rail for a whole week for $60. Not only did it include all of that, but we could venture far and wide! It covers travel into the Blue Mountains, south to Nowra & north to Newcastle….we had a huge choice of places to go! On top of that we discovered a great website for walks that we could do. You can select how long you want to walk for and also find walks that start and end at train stations or bus stops! With the tickets in hand and some printed off maps from this website, that even told you how much flat, uphill and downhill to expect….we were set! We were caught up in one of Sydney’s wettest days on record, that resulted in the train station between the two houses flooding up to the platform and closing it, but that just became a day for cleaning houses, etc.! Over the next few weeks I will share with you some of the great birding adventures that we had on these walking days. However, we had one day when our youngest nephew, George, who is 6 years old came on a birding adventure with us. His older brother went to a birthday party, so we had a day together. He is fond of nature programmes and has 10,000 Birds in his “favourites”. He is hoping for some eagle pictures in upcoming posts, as he has seen some in nature films and they impress him! 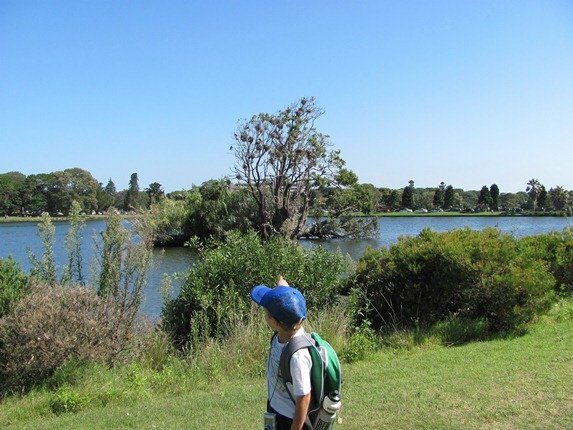 We pretended we were going on a bush trip and carried water and supplies in our backpacks and headed off to Centennial Park. George had been there before, but not as a “birder”! He had the loan of a camera and was keen to get close and see what was about! He has asked that we put some of his photos on the website for him and you can’t disappoint a future “birder”! 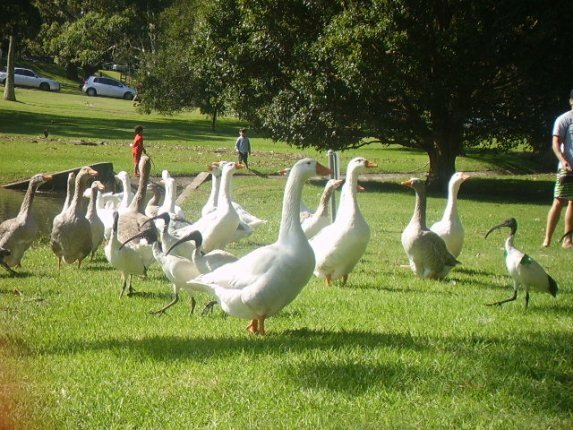 As you can see…the geese were about the same height as George! He wasn’t scared! 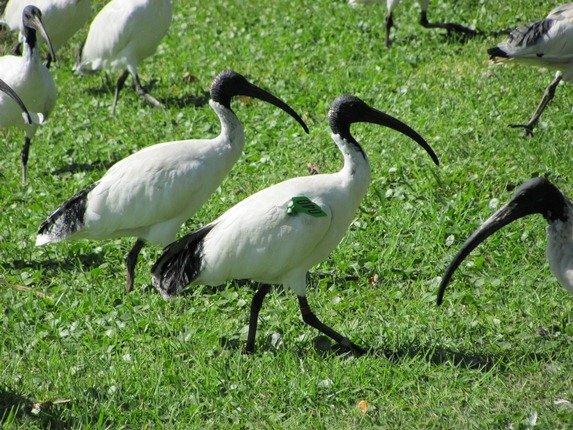 You can see in the picture there is a Australian White Ibis with a tag, which we have reported. This is not the same bird that Duncan had and we did not see that one! There must be at least forty of them out there if they are using all the numbers consecutively! George was very good at finding birds and he soon came across a tree full of nests! The nests belonged to Pied Cormorant, Little Pied Cormorant and Little Black Cormorants. There were a lot of birds sitting and George used the binoculars to see if there were chicks-yes! George discovers nests in a tree! 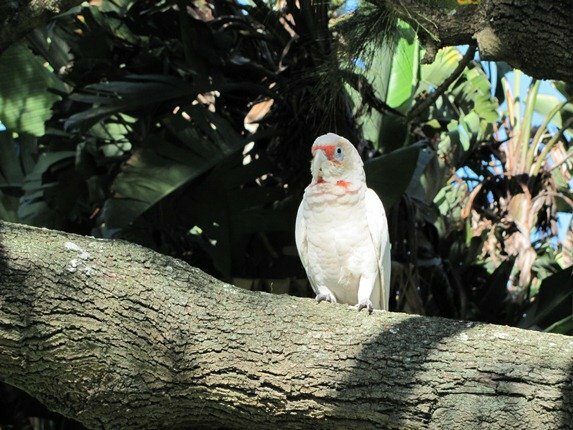 We had a nice variety of birds during the day and we had a close encounter with some Large-billed Corellas. George took some photos, but I am sure he won’t mind that I will use my photo here because I am taller and got closer! As we continued around the park there were a lot of people enjoying a Sunday afternoon in the sun. 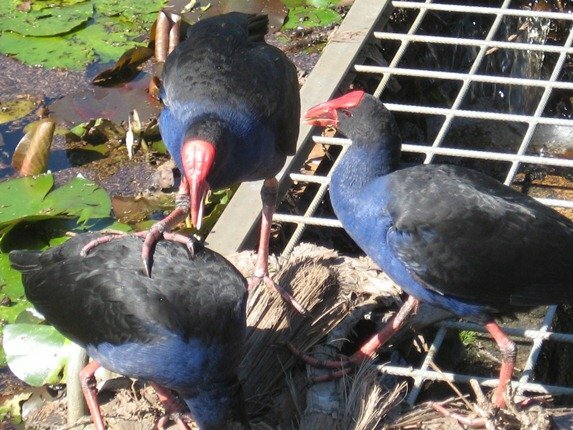 The Purple Swamphens were having a good time too and “Uncle Grant” was fastest with the camera, so he got the photos! George was cross he had missed out on the photo opportunity, but he didn’t ask what they were doing, so that was something his parents can talk about later! Maybe he has already seen enough nature programmes and he knows! 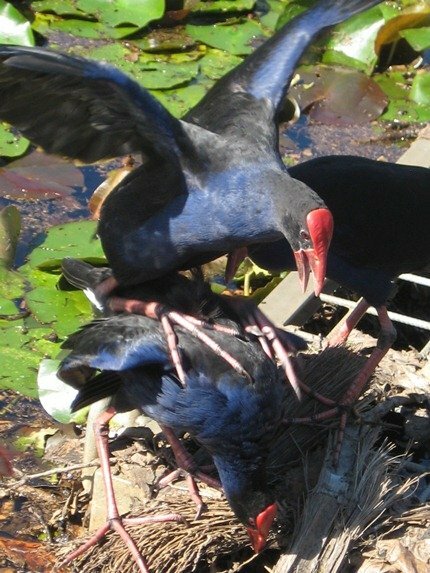 Purple Swamphen action on a Sunday afternoon! Now, there’s one other thing you do when you are 6 years old and you want to be a racing car driver when you grow up….you look for cars! George knows all the emblems on all the cars and can recognise all the expensive cars from afar! This is a car he found whilst birding and this is a photo that he took of it to add to his collection! As he gets older we hope he will join us on birding trips and maybe even convince his brother, Jack, to join us! We were able to treat him to ice-cream as well, as his brother was at a party and would be getting some treats no doubt! If you get a chance to take a keen child birding-jump at the chance! It is rewarding! As far as the list….well, we did well! 74 new species were added from the 119 we saw and 14 were “lifers”. Yeah, right! You know, I also primarily combine the business trips to my survey sites throughout Germany in a way that will produce the maximum data for my empolyer. Definitely not according to the rarities that have been reported from the surrounding areas of the survey sites or along the connecting routes. No, I’d NEVER do that during a fierce and fiery year list competion, no way. And George: nice pictures! You even managed to smuggle a sports car onto 10,000 Birds, which – I think – no one has done before. And a fine one, too. 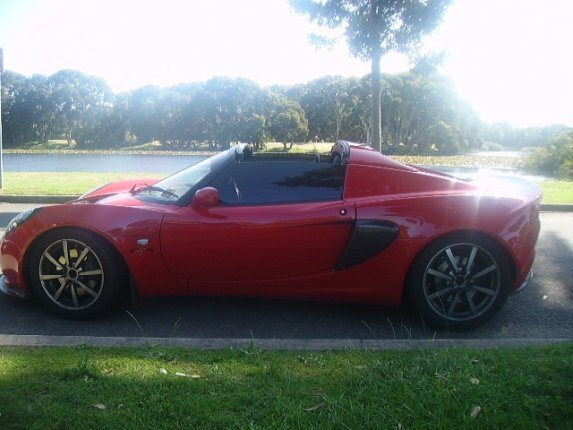 @Clare: look, I am not a huge fan of sports cars, but a Lotus is a nice piece of technology. And it’s an interesting picture, too because of the peculiar light. And I see no denial of forcing your sister to move this year just so you could advance in your year list – so you admit it!? Wonderful post, Clare! George’s photos are fantastic:) My husband has been a Lotus fan since he was George’s age, when he first saw a Lotus Elite, and he identified George’s photo as the electric Tesla, which he had an opportunity to drive a couple of years ago! @Clare & Wendy: no, George hopes someday his employer will offer him one as a company car. Just 12 more days until my flight to Indonesia.